September 21, 2017 By Eugene Nielsen & filed under All Articles, Essentials, Gear. In a market glutted with tactical and outdoor products, every once in a while, a product comes along that stands out from the pack. The Thyrm CellVault™ XL is just such a product. Carrying spare batteries is an absolute must. I needed a way to carry extra batteries for my weaponlights, holographic sights, and tactical flashlights, all of which run on 123A lithium batteries. Although a number of battery carriers are on the market, none of them meet all my requirements. Then I learned about the new CellVault XL. Not only does it meet my needs, its innovative design offers a versatility not found in other battery carriers. : CellVault XL is designed to keep batteries and critical gear safe, dry, and accessible. XL attaches to straps and MOLLE/PALS. Lanyard loops on top and bottom provide additional attachment options. Thyrm LLC is a family-run business founded by Andrew Frazier to create innovative products for tactical and wilderness applications. In case you are wondering, the company is named after the giant Thyrm, King of the Jötnar, who Norse mythology tells us stole Mjölnir, the hammer of the thunder god Thor and the symbol of his power. 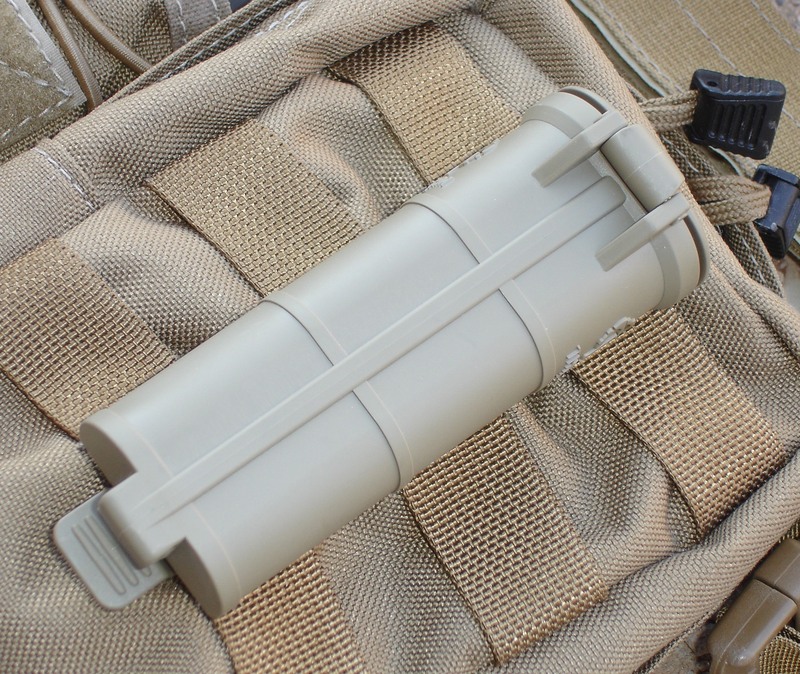 The company’s first product was the SwitchBack® tactical flashlight ring. 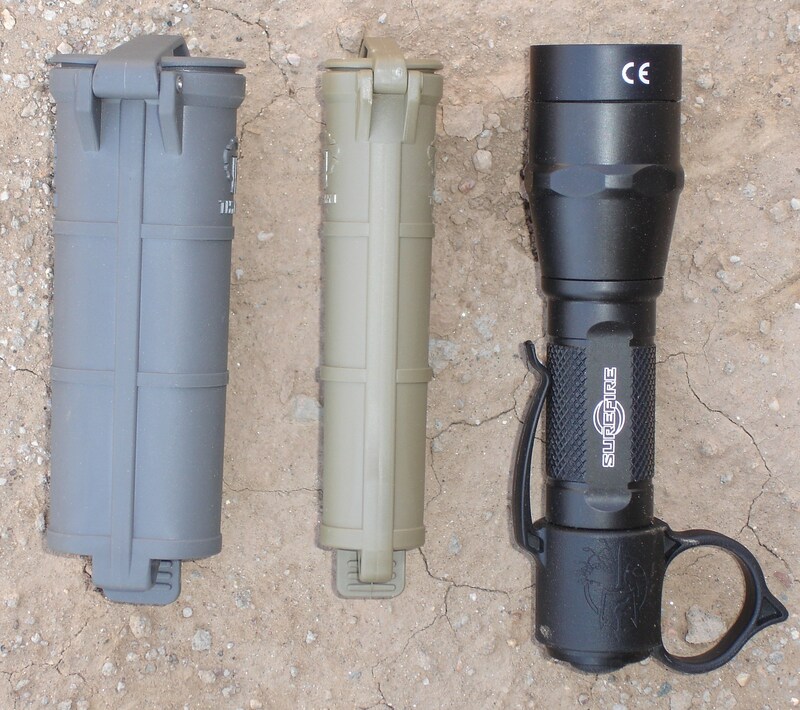 Introduced in 2015, the SwitchBack was developed in collaboration with Chris Costa of Costa Ludus LLC to enhance flashlight manipulation and control. It’s a great idea and works quite well. Thyrm introduced the first CellVault in 2016. The CellVault came about when an officer with the Stockton, California, PD came to them with the idea of finding a way to carry extra batteries on his person without having to rearrange his kit. Existing battery carriers took up critical amounts of space. The new CellVault XL is the big brother of the original CellVault. The XL has the same basic form as the original, but with twice the capacity. It fits a wide range of batteries and can be used to store many other items as well. CellVault XL (right) next to original CellVault for size comparison. XL has twice the capacity of the original. Thyrm’s first product was SwitchBack® tactical flashlight ring, shown here with SureFire Fury Intellibeam flashlight. The XL contains a removable tapered center divider to organize and secure batteries. It allows twice as many batteries to be carried. 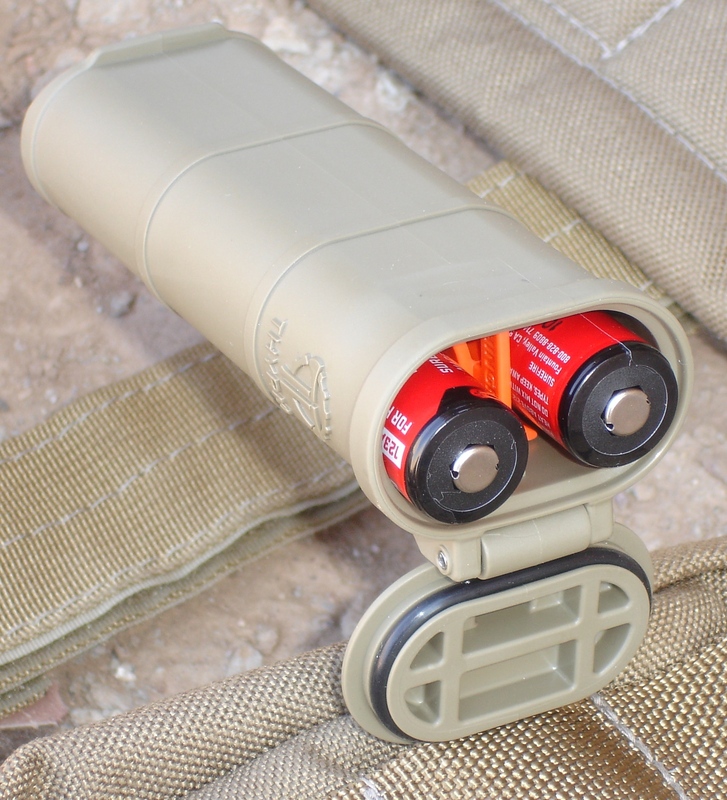 With the divider removed, larger batteries, such as two rechargeable 18650s, or other gear can be carried. The divider prevents 123As from falling out if the XL is inverted. In order to release the 123As, one needs to squeeze the tube. The divider also prevents 123As from rattling, even when the XL is only partially filled. CellVault XL features removable battery divider. Batteries may be removed without removing XL from gear. Like the original CellVault, the XL is made of rugged injection-molded food-grade polymer. The mounting is also unchanged. The XL measures 1.8×1.9×5.1 inches and weighs 1.8 ounces empty. For comparison, the original measures 1.3×1.1×5.1 inches and weighs 1.6 ounces empty. The XL mounts to one available PALS webbing column or to straps via an integrated polymer clip that latches with an audible click. It takes only seconds to attach to or detach from gear. The contents of the XL can be accessed without having to remove it. Lanyard loops at both ends provide additional attachment options. The bottom lanyard loop can also be used to dummy cord the locking latch for additional security if desired. As with the original, the XL is built to withstand harsh outdoor environments. It’s O-ring sealed, dustproof and waterproof, although it’s not designed for prolonged submersion. Rain or a shallow dunk aren’t problems, but don’t go diving with it. Thyrm recommends checking the lip and O-ring for debris and wear that could prevent it from being waterproof over time. The XL can store two 18650 batteries (with divider removed), four AA batteries, six 123A batteries, or eight AAA batteries. It can also store fire starting and survival gear, first aid gear, medications, snacks, valuables, or anything you want safely stored and protected from the elements. Its uses are only limited by your imagination. If you plan to store medications or food products in the XL, Thyrm recommends washing it thoroughly prior to doing so and to consider using a food-safe plastic bag. You can use a test-tube brush, bottle brush, or toothbrush to clean the inside of the tube. The XL complies with FAA regulations for carrying spare lithium batteries protected from damage and short-circuit on board commercial aircraft. See 49 CFR 175.10(a)(18) for complete regulations or call your airline, as there are additional requirements. To sum it up, the Thyrm CellVault XL is an outstanding piece of kit and highly recommended. It’s available in Urban Grey, Black, Olive Drab, Rescue Orange, and Flat Dark Earth. Suggested retail price is $29.99. TCV-2. 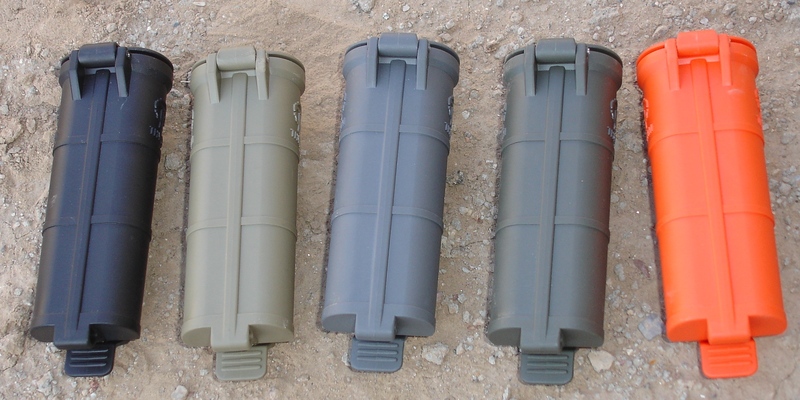 CellVault XL is available in five colors: Black, Flat Dark Earth, Urban Grey, Olive Drab, and Rescue Orange. All Thyrm products are designed and manufactured in the USA. Eugene Nielsen’s background includes protective intelligence investigations and threat management, as well as red teaming security consulting. He has a BA degree from the University of California. He owns and operates an investigative and security consulting firm and is licensed in both California and Arizona.